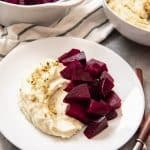 Pantzaria me Skordalia (Roasted Beets with Garlic-Potato Spread) is a wonderful Greek food that is traditionally served as a meze but can also be served as an appetizer or side dish. Heat the oven to 425 degrees F. Place the unpeeled, washed beets in a large baking dish and drizzle with a little olive oil. Add 1 cup of water, then cover the pan tightly with heavy duty foil and crimp edges well to form a tight seal that will help the beets to steam as they roast. Bake the beets in the oven for around 60 minutes, until a skewer or knife inserted into the beets slides easily into the center. Depending on the size of the bites, you may need additional time for the beets to soften through. Let the beets cool for 30 minutes until cool enough to handle, then rub your thumbs over the skin of the beets to peel and the skins will slide right off. Cut the beets into small, bite-size pieces and set aside. Boil the peeled, diced potatoes in salted water until very soft and tender, then rinse in a colander under running water for 20 seconds to remove some of the excess starch. Let the potatoes drain thoroughly. In a food processor or using a mortar & pestle, if you have one, process or mash the garlic and pistachios into a paste, with the vinegar, then add the salt and pepper. You can add up to 2 tablespoons of cold water, if needed, to form the paste. Transfer the garlic-pistachio paste to a large bowl and add the potatoes while still hot, then mash well using a potato ricer, food mill or potato masher, until the potatoes are smooth. Stir in the olive oil thoroughly until it is absorbed by the warm potatoes, (if the potatoes are cold, the olive oil won't incorporate as well), then add the Greek yogurt and stir until combined. Serve the roasted beets with the skordalia spread on the side, sprinkling with additional finely chopped pistachios for added texture and crunch.